The AIPM’s Fellowship program aims to recognise members of the project management community who have rendered exceptional service to the Institute and are prominent in the profession of project management. Penn is the first Australian-based Honorary Fellow of the AIPM. Through the fellowship, the Institute recognises his efforts to promote and acknowledge the importance of project management in the delivery and implementation of successful business strategies. The Telstra CEO has been a vocal advocate for the profession of project management throughout his career, including in his previous role as CEO of AXA Australia Group, and has led some of Australia’s largest organisations in their implementation of project management principles in their day-to-day dealings. In keeping with its acknowledgement of the importance of project management to its success, Telstra has appointed a Chief Project Officer to lead its community of project managers. 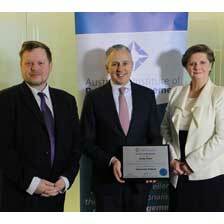 AIPM CEO Yvonne Butler and AIPM National President Ian Sharpe presented the Honorary Fellowship. Penn added that not only does project management make a difference to a company, “it can make a difference to Australia by increasing productivity of the Australian economy overall”.